By Freeola Support on 2nd April, 2019 | 1 Comment(s) | 3 out of 3 people found this article useful. Welcome to the Freeola Internet customer support pages. This guide is designed to help with setting up a Freeola email address﻿ on Microsoft Outlook 2013. For more internet help topics please visit our main Support Page. 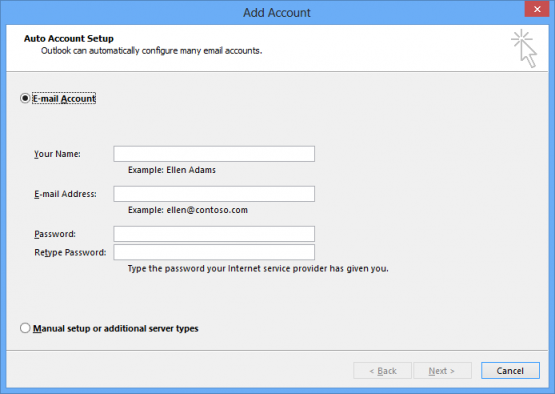 If you do not already have Outlook 2013 installed, you should be able to install it from your Microsoft Office 2013 installation disk. Alternatively, if you would prefer to use another e-mail client, you may be able to find a relevant guide on the Freeola E-mail Support Guides page. Load Microsoft Office Outlook 2013 from the Windows Start Menu. If this is the first time that you have launched Microsoft Office Outlook you should automatically be shown a form similar to the one pictured below. If this shows, please proceed to step 4. If this form does not show, you will need to select File, Info and then Add Account. 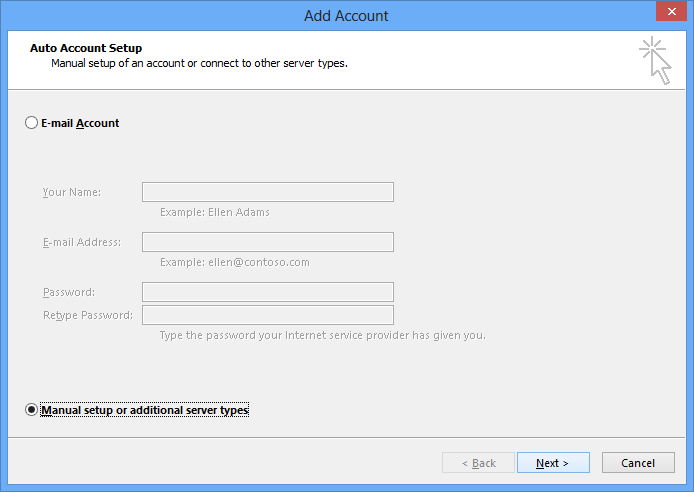 You will then need to select the Manually setup or additional server types option and press Next to continue. You will then be asked to specify the service type. 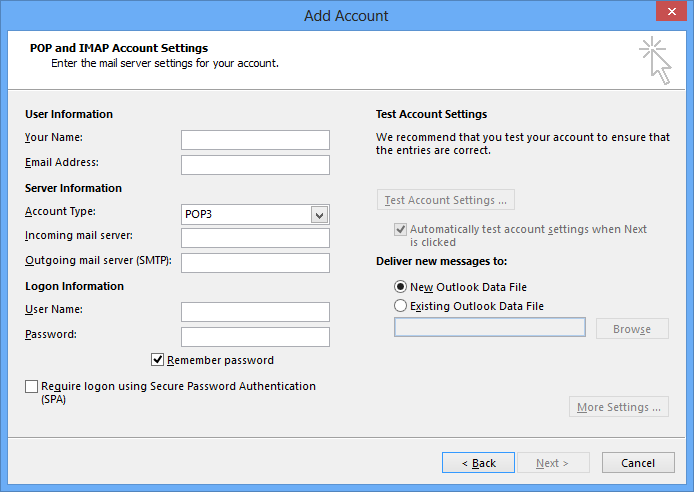 Select POP or IMAP from the options provided. 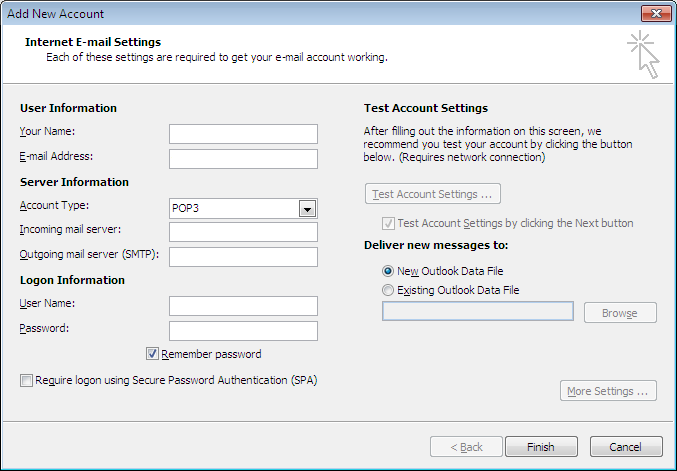 Account Type: Select IMAP or POP3 depending on the setting in your MyFreeola account. Incoming Mail Server: This will take the form of yourdomainname.freeolamail.net where 'yourdomainname' is your domain name with any dots ( . ) replaced with hyphens ( - )﻿.﻿﻿ For example, if your domain name was freeola.co.uk, the incoming mail server would be freeola-co-uk.freeolamail.net. Password: should have already been obtained at the start of the guide. If you do not already have this information, it can be obtained from within your MyFreeola Account. Now select More Settings then Outgoing Server. On this tab check My outgoing server (SMTP) requires authentication. In the same window, select the Advanced tab. 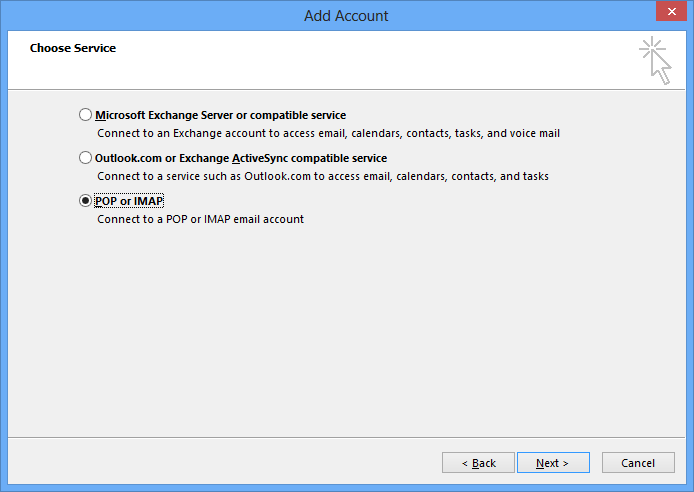 For Incoming server enter 993 if you are using IMAP, 995 with POP and select SSL. This article enabled me to fix the problem I had whereby sending email worked without issue when I had my laptop on my home network and others in the UK but failed when I was in the States and Australia. The fix was the Port 25 to 2025 change.